Can you get the job done while saving money and still keep your sanity? Let me answer your questions and show you how. When it comes to repurposing and upcycling – the possibilities are really endless and there is always a way to create something amazing. The first step is deciding what item you want to upcycle. Is it something you saw in a catalog or magazine but it’s way too expensive? Maybe it’s an heirloom you don’t want to let go but aren’t sure how it’ll fit in your home. Or you found this really cool item but aren’t sure what to do with it. Look at places like thrift stores, garage sales, dollar stores, and what you already have in your home or have inherited. Don’t forget to check out the free things on websites and on the side of the road, as those can be great finds. Once you found your item – ask yourself – how can I make this item fit in my home? What do I see it being or how can I use it? Maybe you find a candle holder and you want to make it a solar holder for our yard to create ambiance. Dishes can become birdfeeders, dish flowers in your garden. Dollar Store mirrors can become a Pottery Barn Hack and save you tons of money. Grandma’s rocking chair reupholstered now fits into your home décor. Take action and create it. You can fix it, paint it, or dismember it and create something new. Don’t be afraid you will mess it up. Mistakes happen, and everything can be fixed. What do you do with the item when you’re done? Of course the obvious is to put it where you might have envisioned it, but that isn’t where it stops. 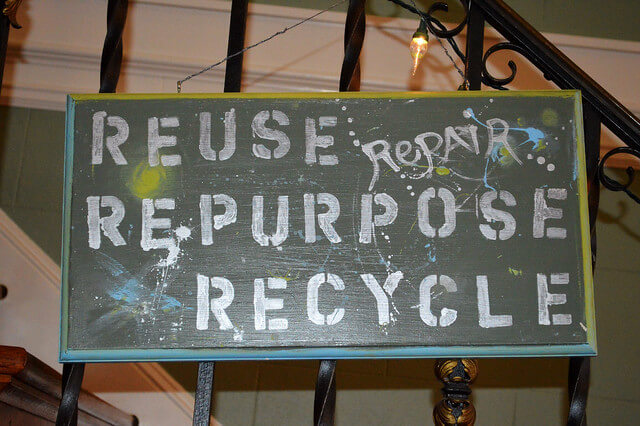 Repurposing and upcycling items are great things that can be given as gifts. Things don’t have to be expensive to express our appreciation and gratefulness to someone we care about.